MidModMen is pleased to host two new collections of prints from artist Lisa Rydin Erickson. The Alphabet collection is a series of abstracts combining letters, color and negative space. The Abstracts collection incorporates earth, sky and other organic elements with a rich color palette. Prints from both collections will be available for sale at MidModMen+friends during the exhibit. The exhibit opens Friday, May 16 with a reception from 5-8 PM. 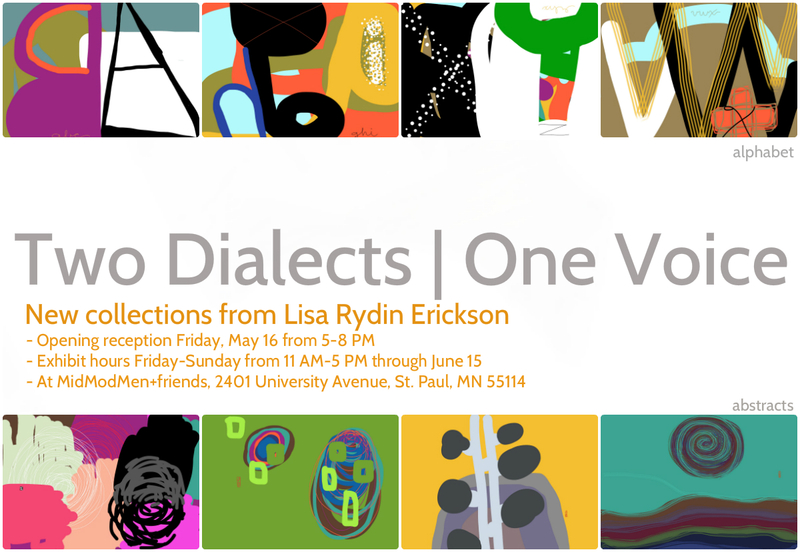 The show runs through June 15 with gallery hours each Friday through Sunday from 11 AM-5 PM at MidModMen+friends, 2401 University Avenue, St. Paul, MN 55114. Lisa is a diverse and highly productive creator. Though primarily a painter, she has diversified into drawing and animating on the iPad, illustrating books and making stop-motion animations with sumi ink and rice paper. She has painted murals and backdrops for performances and taught art at the University of Minnesota Landscape Arboretum with at-risk teens. In 2013 her animations were shown along with script and music in a presentation at the University of Minnesota Landscape Arboretum, MinnAnimate and the Minnesota State Fair. Also in 2013 she collaborated with her daughter to create large-scale pieces for the 2013 Flint Hillʼs International Children’s festival. She is a native Minnesota artist living in Saint Paul with her husband and two teenage children. She received a B.F.A. from Kansas City Art Institute in painting and printmaking.